Q: Is the Pepsi Spire Machine Right for My Location? The Spire machine is Pepsi’s computerized soda vending machine. It offers 1,000 possible flavor combinations in a very hands-on, entertainment style experience. That being said, not every location is best suited for this type of fountain soda. We’ll connect on the unique details that define your business or building, and discuss how to best serve the people within. Q: Do I Have to Manage the Inventory of Supplies and Components for with my Fountain Machine? While you’re the one who sees the stream of operation on a daily basis in your business or c-store, you and your team will see the areas of need across all lines of business. If you’re low on cups or straws, you’ll notice that and attend to the need. On our end, we’ll make sure you have enough inventory for traffic as well as discuss scheduling for restocking products with your sales rep.
Q: I Don’t Know What to Offer My Customers; Do You Have Input? We do. We know a thing or two about fountain soda and how to appeal to a wide range of patrons. Taste, preference, trends, and variety are things we’re continuing monitoring, and keeping pulse of based on consumer trends and choices. 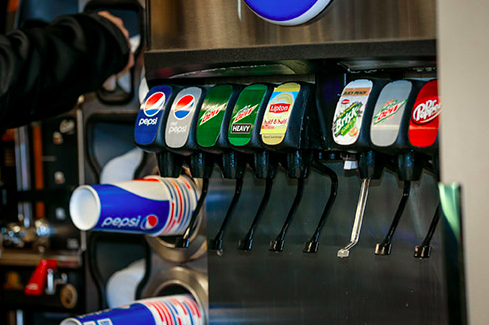 Did you know you could offer specialty beverages like Mountain Dew Kickstart on fountain? Or even sparkling water? The world of fountain beverages has extended beyond the basics to offer every discerning taste and unique palate exactly what it desires. Q: Do I need to Decide Between Post-Mix and Pre-Mix Dispensers? We’ll help you by making the best recommendation based on your business or building. If you're not sure what this question means, post-mix dispensers have syrup pumps, carbonator, and a CO2 tank. These types of fountain dispensers are typically used in restaurants, bars, hotels, and convenience stores. The soda or beverages in pre-mix setups come premixed and ready to drink in five-gallon tanks. The system still includes a dispenser and CO2 tank, and work well for events like school carnivals of fundraisers. Q: What Happens if Certain Fountain Beverages aren’t Being Sold or Consumed? Everything is fluid (pun intended). Together, we’ll determine the brands and styles your system is serving, and how well. Perhaps you have a few lines dedicated to non-soda that just aren't moving as quickly as the soda counterparts. In soda fountains, space is a premium; there is a finite number of spaces to feature beverages. You want to enjoy knowing that what your machine offers is what people are looking for the most. The same is true on the flip side. If your customers are asking for product you're not featuring on your fountain, we want to know that, too. Q: What Does the Care and Maintenance of a Soda Fountain Dispenser Look Like? We’ll show you how to clean your equipment, rotate product, and handle the most basic troubleshooting. Bernick’s will provide regular service to ensure proper cleaning and maintenance, should your system need it. And correct ratio of syrup to carbonation will be confirmed. Long story short, that's what we're here for. Q: How Much Does a Fountain Machine Cost? Bernick’s will install your site’s fountain system at no charge to you**. We’re proud to partner with you to best serve our community together. **In some states, we're required by state law to charge rent on equipment. Check with your Bernick's Rep to see if this applies to you. Q: I’d Like to Offer a Soda Fountain Experience That’s “Different” to My Customers. How Do I Make This Happen? We say the same thing … so, we’re on the same page! Read our blog Celebrating Soda via Fountain Options: An Infographic and Soda Fountain Technology to learn why we’re excited about the state of fountain soda. This directly impacts you, as well as your customers.